Ben Johnson Jr. 40L 05H, former dean of the School of Law, died June 30, 2006, of pneumonia at Emory Hospital. He was ninety-one. As a lawyer, he argued hundreds of cases in trial and appellate courts, including the U.S. Supreme Court. He led the effort to desegregate private universities in Georgia in the 1960s, as well as taking on smaller, more personal battles for civil rights. When African Americans wanted to worship in all-white churches in Atlanta, Druid Hills Baptist Church responded by ushering them to the basement where the audio of the service would be played. Ben Johnson Jr. responded by “organizing a dissenting group of white members to worship in the basement with them,” said Ben F. Johnson IV, sharing family remembrances of his grandfather. Johnson served as deputy attorney general for the state and, as a state senator, was the principal author of the legislation that created Atlanta’s public transportation system, MARTA, in 1965. He was founding dean of the Georgia State University School of Law in the early 1980s. 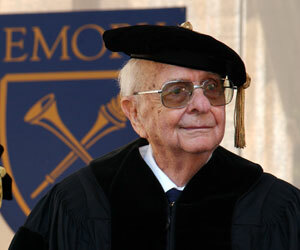 Johnson, who was the father of Ben F. Johnson III 65C, chair of the Emory Board of Trustees, received an Emory honorary degree in 2005 for his service to the University and community. “For almost ninety-two years, he walked everyone around him through the grand rounds of his life,” said Ben Johnson IV, “and we are now blessed, burdened, challenged, and charged to protect the integrity of his aspirations.”—M.J.L.